The Ready Jet Go Games category is the perfect game category for all those of you with an interest in space, science, and the world around you. Each of the games here take you on incredible adventures, and they all have something to do with space, and by playing them, you will be able to learn a great deal. Of course, you will also have great fun! The Ready Jet Go Games category was created in 29.06.2016 and from there we added more than 7 games for boys and girls that are interested in gaming online. 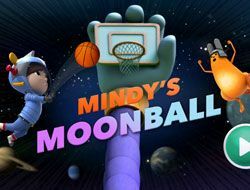 These games were voted in total 27 times and the best game from Ready Jet Go Games it's Mindys Moonball. 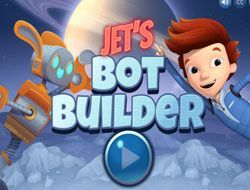 We recommend you to play the latest game added in this category on 14.04.2019 which it's Jets Bot Builder. If you want Ready Jet Go Games, just click here. For all children who love cartoons and also love space exploration, science, aliens and other interesting things like this, our team has created the Ready Jet Go Games category, a category of games which we hope that you are going to love just as much as we love. Ready Jet Go is a new animation series which has started airing on the PBS Kids block in February of 2016, and since our website is always searching and browsing to be sure that all the new categories are going to be found here, we have created the Ready Jet Go Games, because online games based on the show have been created, and we want to be able to offer them to you right here, on www.friv-games-today.com. Since Ready Jet Go is a series which is not airing on the highly popular channels for cartoons, we are aware that not all of you might have heard about it, so if you want to play Ready Jet Go Games, but would like to find out more about it, like it's plot, characters, and other things like that, you will be able to find all these in these description, where, at the end, we are also going to tell you about the very fun Ready Jet Go Games that can be found on our website! In the show we follow the adventures of a family of aliens, called Propulsion, which is comprised of the main character and the son of the family Jet, and his parents, Celery, the mother, and Carrot, the father, and they are a family which come from the fictional planet known as Bortron 7. Why are they on Earth? Well, they are going through the galaxy, from planet to planet, trying to make a travel guide for all races in the universe, and now they are on Earth, where they are fascinated with their research on human society, customs, and our planet. Jet, the main character, became friends with three human children, Sean, Mindy and Sydney. The three children, together with Jet, get the chance to learn and explore the world, take rides in the alien's family car, which can transform into a spaceship, which is driven by Celery, and are always having some sort of fun activities. In the show, you do not only see the characters have funny interactions, and go on interesting adventures, but at the same time, through their eyes, you can learn interesting things about the world around you, which even you might not have known. It sounds really interesting, doesn't it? Well, you will be able to have the same fun experiences on our website also, by playing the very fun Ready Jet Go Games which we have added on this page, games like Jet's Planet Pinball, Mindy's Constellation Exploration, or Sean's Rescue Quest, which are just three examples of the incredible Ready Jet Go Games available on our website! Well, we hope that you are now interested in this category, and the first thing you do after you are done reading this, will be to begin playing the games! Good luck in all of your adventures!